Follow me on my long, arduous journey of experiencing a chronic multi-system illness that was the master of all masters at disguising itself for years on end to FINALLY being diagnosed with Late Stage Lyme Disease (or, as I like to call it – the Great Gecko Illness). My goal in writing this blog is to educate others on Lyme disease so that you do not fall victim to years of misery without a diagnosis like myself. I want to help as many people as I can, and with there being so much misinformation out there on the internet and from the medical community, I feel that sharing my experiences on social media is the best way of communicating with the world. It’s absolutely absurd that I am a 31 year old female who leads an extremely healthy lifestyle, and yet I am probably the unhealthiest healthy person I know. When I say extremely healthy lifestyle, I actually mean it. For instance, I eat like a caveman avoiding all things gluten, MSG, GMO, processed, etc down to what type of salt I use. I even go as far as only drinking chemical free spring water from glass containers. I make it a point to stay active in yoga, tennis, workout classes, you name it. There are virtually zero chemicals in my home.. and by that I mean, almost every cleaning product and personal hygiene product is free of synthetic chemicals (aka free of hormone disruptors and carcinogens)…and I can guarantee you that there has been time spent researching all of the items in my home. You may think I am crazy, but it gets worse. I have 2 pricey industrial grade VOC air purifiers running in my home and at my office at all times to filter out chemicals. I even have a custom-made poplar wood chemical free FIR sauna that I use to detox! Coffee enemas, you name it. So yes, when I say extremely healthy, I am one of the few people in this world that actually means it. I am by no means trying to brag, I am merely trying to paint a picture for you. Healthy! So the question is, how can someone who is leading a crazy healthy lifestyle like me be plagued with chronic illness? I have one word for you, LYME! Here is my short definition for Lyme Disease – I look healthy, I sound healthy, but the reality is, I am dying with pain on the inside! So you are probably wondering how this all came about? Let’s take a stroll down memory lane. Pre-Lyme (Pre-Gecko Attack), I was hardly ever sick. I was extremely energetic, outgoing, fun, happy, personable, etc. Of course I had my faults and bad days just like anyone else, but what I am trying to get at is that for the most part, I was a healthy, happy individual with a positive outlook on life. I had everything going for me. My only downfall was that I was very naive and in for a rude awakening. Around 7 or 8 years ago, I vaguely remember constantly picking at a certain bump on the back of the lower part of my head. At first I chalked it up to it maybe being a form of OCD bc I also like to pick at my face every night as well. But then something weird happened to make me think otherwise. I just so happened to be driving to my sister’s wedding when I felt movement on the back of my head in that same spot I had been picking at for months. I gripped onto this weird item protruding from head while sitting at a stoplight, and pulled it so hard that I almost hit my head on the steering wheel. Blood went spewing from my head as it detached. Yuck! I remember being so freaked out by this that I had to pull over to snap photos of the weirdness that had just occurred. My first thought was, “Wow, this kind of looks like a tick. I should probably get this checked out bc what if I have lyme Disease!” I went to the doctor only for him to laugh at me and tell me that I was silly for thinking that I might have Lyme Disease. He told me that it was more than likely an inflammed ingrown hair or some sort of scab. I was naive and trusting, so I went about my business as usual and didn’t think of the tick bite for years to come. I may or may not have talked the doctor into giving me an antibiotic just in case, but I remember not taking anything for it due to feeling safe. Over the course of the next 7 years, I experienced the weirdest, most painful symptoms. I went from doctor to doctor being diagnosed with numerous chronic illnesses, all being somewhat true. But all of these doctors missed one important thing, THE CAUSE of these illnesses. I have been diagnosed with the following: Chronic fatigue, Multiple Chemical Sensitivities, Toxic Encephalopathy, MTHFR, Methylation Issues, Hypothyroidism/Hashimotos, Food Disbyosis, Gluten Intolerance, various food intolerances, Asthma, Arthritis, MS, Migraines, night seizures, Irregular heartbeat, IBS, Bitoxin Illness, Mold Illness, Low/Dying population of White Blood Cells, being in the 90th peRcentile for a number of carinogenic chemicals in my blood, etc… the list really goes on and on. You would think that at least ONE of these doctors would have been smart enough to test me for Lyme Disease, but nope… none of them were. The Great Gecko was fooling all of us! For the longest time, I was mainly experiencing food intolerances, occasional moments of rage and mood swings (usually only with my loved ones, sorry! ), Chronic Fatigue, Toxic Encephalopathy, Migraines, and severe Chemical Sensitivities. For those of you who are not familiar with Chemical Sensitivities, it is very debilitating and isolating. Everything “scented” from deodorant to hair spray could potentially trigger a full on Toxic Encephalopathy reaction in my brain. It is like someone kicking me in the head and at the same time electrocuting my brain. By looking at me, you’d never guess any of this is going on in my head whenever it’s happening. However, if you know me well you can totally tell that I cam having a reaction by the way I act. This type of brain inflammation makes all of my neurons misfire enough to where I have brain fog, confusion, and I immediately become moody. It hurts so bad that I have to leave wherever I am at immediately. It doesn’t just stop when I walk away either. It keeps pulsating for an hour to 24 hours afterwards depending on what chemicals I was exposed to. In addition, it is not just personal hygiene products, it is a number of other things that the average person doesn’t even notice. The dyes of cheap clothing, ink from pens or letters, plastic toys that haven’t fully outgassed, fake wood floors/cedar/dryer sheets – all realease formaldehyde, carpet (boy carpet is unhealthy for you and takes years to outgas! ), new homes, potpourri, the simplest of candles, cleaning products, etc. Again, I could go on an on about all of the things that I react to, but I doubt you have enough time! It’s that bad! Someone could be on the other side of a huge room, and I will be reacting to something that they are wearing. My sense of smell is about 1000 times greater than the average joe. Now think about trying to go ANYWHERE without bumping into one of these triggers. Think about trying to work in an office. It is basically impossible! The few times that I make it out somewhere these days, I just have to deal with being sick and hold it all in so that I don’t ruin everyone else’s night. That or I just leave soon after getting there. To put it lightly, this part of my journey has been tough! I think the worst part of the Multiple Chemical Sensitivities (MCS) is that it is really hard for your friends and acquaintances to understand what you are going through. Before the Lyme diagnosis, I am sure some of my friends thought it was all in my head, while others probably thought I was just blowing things out of proportion. In addition, there is always someone getting offended when I mention that their lotion or deodorant kills my head. You can tell your friends/acquaintances a hundred times not to wear A B or C that bothers you, but they still do. Do you keep bringing up an uncomfortable subject or do you just come to the realization that you should probably just stay away from those people in general? Dealing with all of the back and forth about finding out who will be where, and whether of not I can handle being around their personal hygiene products was becoming more trouble than it was worth. So I have made some changes and simplified my life! lol. I figure that I should probably only surround myself with people who serve me well (i.e. those that are willing to wear unscented products around me). I am definitely a social person, so this has been quite the transformation! It wasn’t until just a few months ago that a variety of new symptoms started to appear like joint pain, random shooting pains, eye muscle twitching, ringing ears, memory loss, achne, arthritis, hearing going in and out, random bouts of blurred vision, heart issues, a strange sensation that something is crawling on my skin, excessive thirst, numbness, tingling, air hunger, increased static electricity, increased taste, etc. It has even become painful to walk and sit down! Those are kind of important if you know what I mean! My jaw, gums, and teeth have started to ache so terribly bad that I feel like someone is pulling out my teeth. Apparently there is name for that too, TMJ. In addition, I’ve been really struggling to remember words that I know very well (easy words!) and sort through my thoughts in order to speak in a normal conversation. Short term memory loss. For example, I was texting a friend of mine about my weekend, and realized that I couldn’t remember the anything about the movie I had seen the just the day before. Not a clue what it was about or who was in it. Bad example, but you get the point. It’s as if the information is there, but sometimes I can’t access it. Broken English 101. With all of these new symptoms, or shall I say new clues, I had been racking my brain trying to make sense of all of this. I kept thinking that this cannot be the end all be all. There has to be a reason why I went from healthy to unhealthy. All of this has to be connected. But how? Finally, my big break. I ran into an acquaintance of mine that suffers from Lyme Disease. He’d heard through the grapevine that I was experiencing Multiple Chemical Sensitivities. He told me that he has an ozone machine at his house and that it has helped people with MCS symptoms. It hadn’t occurred to me until then that I hadn’t even researched or considered Lyme Disease as a possibility. To be honest, I didn’t even know what it was. The next morning I researched Lyme and started to connect the dots. Who would have thought that the tick bite from 7 years prior might have caused me to be ill this many years later?!?! I hadn’t even thought about that incident in years! From that moment on, I was convinced that I had Lyme Disease. Now I just needed to get a positive diagnosis! Randomly, my mom knew of phlebotomist who is known for diagnosing numerous people within my moms circle of friends of serious diseases and infections. My mom claimed that just by looking at so and so’s blood she was able to save him from cardiac arrest, she diagnosed so and so with Lyme, and so and so with cancer, etc. I was thinking to myself, “Hmm… I am not so sure if this lady can really diagnose people just by looking at their active and dry blood samples under a microscope…. but what do I have to lose at this point?” I visited this lady and decided before I got there that I was going to test just how good she was by only giving her one of my symptoms (similar to the game you would play with a psychic). I told her that the reason I was visiting her was because I am constantly fatigued. Boy, she really surprised me. With me telling her almost nothing about my symptoms, she went down the list of everything I had going on from chemical and food sensitivities down to my dangerously low/dying population of white blood cells. At first we spent a good while looking at all of the viral, bacterial, parasitic infections wreaking havoc in my blood. But then, she busted out the active blood culture and mixed my blood around a little bit to get the spirochetes (Lyme) to come out of hiding. I was watching them swim across the screen in utter disgust and disbelief. So I told asked her point blank, “Please don’t get me all excited in thinking that I have actually figured out what I have if you don’t know for sure. Are you 100% without a doubt positive that I have Lyme Disease?” She stared me in the eye and said, “There is no way that you do NOT have Lyme!” She then reminded me that she wasn’t a doctor, and that I still had to be tested and diagnosed by doctor in order to have this on paper. I went back to my doctor and asked him why he hadn’t tested me for Lyme. He obviously didn’t have a good answer. (Ugh, why didn’t any of the numerous doctors that I have seen over the years suggested this for that matter?!) Like most doctors, I could tell that he didn’t know that much about Lyme. Based on the way he answered my questions, I knew more about Lyme than he did which was quite disheartening considering how well-known he is for being such a “great doctor.” I mean, the man must’ve had 30 training certificates framed on the wall of his office, so I figured he was legit in regards to diagnosing people. The sad part is that he probably was legit, but just hasn’t been trained about Lyme. To make things worse, he treated me as if I was making the whole thing up in my head. Nonetheless, he agreed with me that I should be tested for Lyme. He then sent my blood work to Lab Corp for testing. DRUM ROLL……. The test came back negative for Lyme. This was no surprise to me. Seeing as how I had more than done my research, I was expecting this result to come back negative (Now bare with me as I try to explain this). 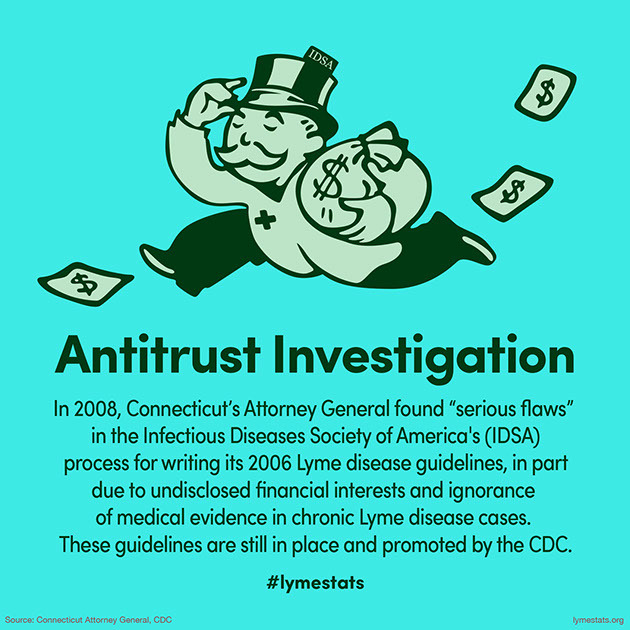 The only 2 western blot Lyme tests approved by the CDC and Texas Medical Board are HIGHLY FLAWED and INACCURATE. Get this, they are a mere 30% accurate!! 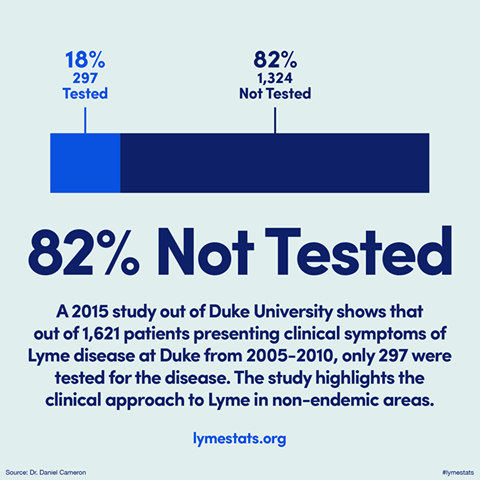 What’s more, is that the approved Lyme tests (Lab Corp and Quest) do not test for of the most significant markers for identifying Lyme Disease. Say What? Isn’t that kind of necessary for such a common disease? There are HUNDREDS of strains of Lyme!! Wow (gasp)! Think about how many people go undiagnosed each year! With that being said, I found a better doctor that would send my blood work to the best lab company possible, iGenex. They are 90-95% accurate (yes, that accurate!) 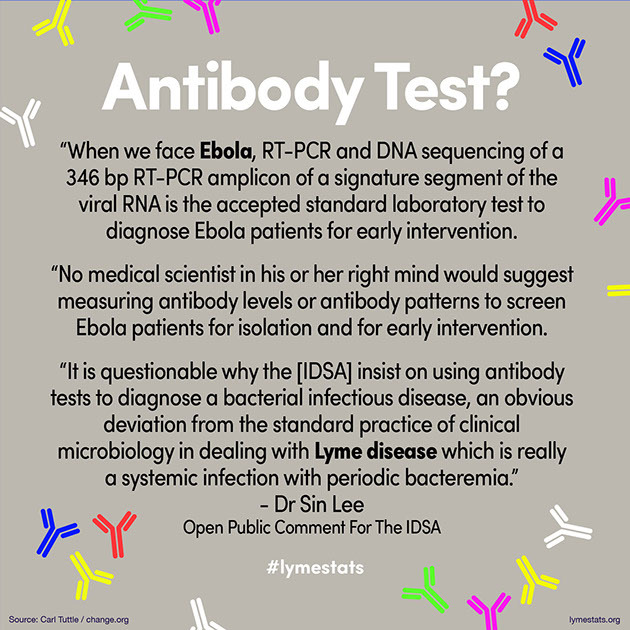 and actually test for all of the significant markers for Lyme Disease. Even with tons of evidence behind the accuracy of the iGenex Test, oddly enough the Texas Medical Board refuses to approve it for diagnosing Lyme. This is true with the majority of states. So here is my question… If you are trying to diagnose a Lyme patient, why on earth would the board approve 2 of the most ‘inaccurate’ tests when there is a Lyme Test that is 90-95% accurate available? 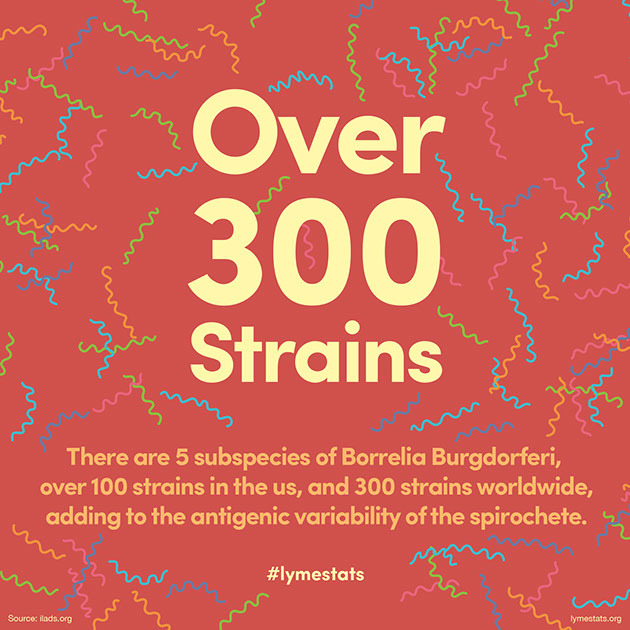 Why would you only test for a small portion of Lyme strains, when there hundreds? Yeah…. sorry folks, this isn’t making much sense to me. It is plain common sense to approve the more accurate test! I TESTED POSITIVE! MYSTERY SOLVED, FINALLY! Now it all makes sense! Years and years of not feeling quite like myself and having all of these strange neurological and physical symptoms. Traveling symptoms and a slow build up to full blown Chronic Lyme Disease makes sense as to why it was so hard to solve the mystery. Although the news was bad, I am thankful to finally know what I am dealing with! So the main reason in my writing this is 1) to help people understand what I am dealing with, but 2) so that people who have been diagnosed with any of the following ( MS, MCS, Fibromyalgia, Parkinson’s, Alzheimer’s, 5th’s disease, Thyroid Disease, Bells Palsy, Autism, Encephalitis, Lupus, Arthritis, IBS, ALS, just to name a few!) realize that these are actually symptoms of Lyme Disease. Really, there are 400 (400!) illnesses that are caused by Lyme and the current medical system has a name for each and every one of them. However, they never bother to look at what caused the illness to begin with. Shocking, but very true. So now that I know what I am dealing with, I can start taking medicine and be done with this, right? Ha, I wish. You will be shocked at everything I am about to tell you, so brace yourself. If you are the type of person that believes companies like Merck and Monsanto have your health in your best interest, then this may not be for you! If you are that type, then I’ll just assume that you also believe in the tooth fairy as well, ha. I learned that up until this past year, the CDC has claimed that there are only 30,000 new cases of Lyme Disease each year. This past year, they have now all of the sudden changed this total to 300,000 new cases per year! In addition, based on a survey that went out in 2012, it suggested that the number of Lyme cases is actually closer to 1 – 2 million people per year. Say whaaaaa? Can you say, EPIDEMIC? 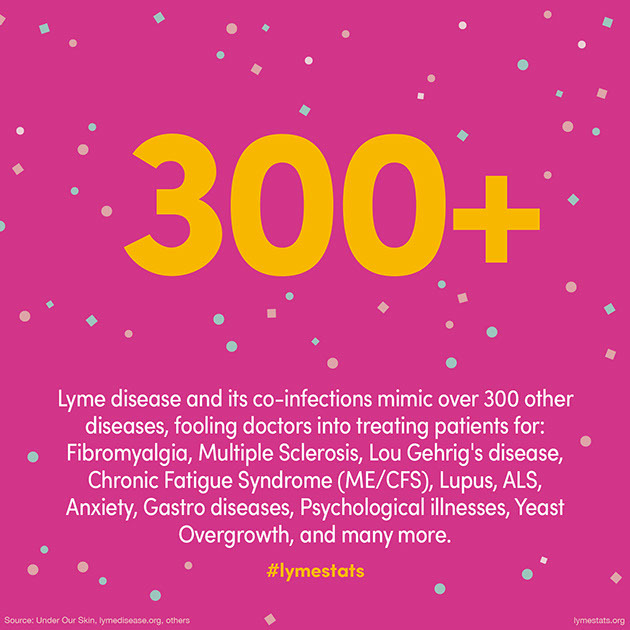 AND... if you really dig deep into how many illnesses in the U.S. are misdiagnosed/actually caused by Lyme, you will soon realize that the number of people with Lyme Disease is actually much much larger than 1 to 2 million. It would be ignorant for me to guess an exact number, but I would definitely say that a large percentage of the population has Lyme Disease without even knowing it. I learned that despite there being an estimated 300,000 new cases of Lyme Disease each year according to the CDC (not to mention the large number of folks that go undiagnosed due to inaccurate testing which makes it closer to millions upon millions), and ever mounting evidence that Lyme is a chronic infection (300 peer-reviewed articles to be exact! ), that the CDC, IDSA, and the New England Journal of Medicine refuse to admit that Lyme is a Chronic Disease (aka a persistent infection of the body). Why on earth does the CDC and the IDSA still not acknowledge Late Stage Lyme Disease as a chronic disease? Give me a break. In addition, as I searched for a doctor, I learned that there are only a handful of ‘conventional’ doctors in the state of Texas that will treat for Late Stage Lyme Disease. With there being 300,000 (AKA millions!) new cases of Lyme each year and an ever so large number going undiagnosed, wouldn’t you expect there to be more doctors in the state of Texas treating for Lyme? 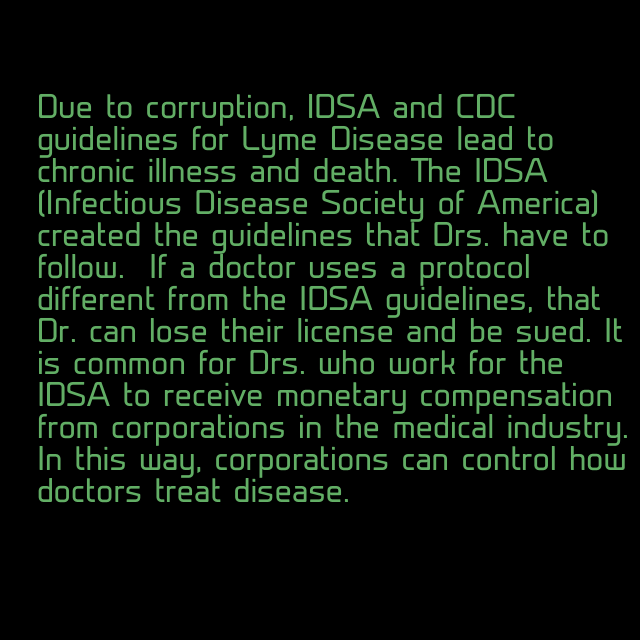 Interestingly enough, I learned that the Texas Medical Board will take away your license if you try to treat for Late Stage Lyme Disease or Chronic Lyme. Once again, Say Whaaaa? They claim that their reason for doing so is because the CDC does not consider this disease to be a “chronic” infection based on the guidelines written by the IDSA. So you are probably just as confused as I was when trying to make sense of all of this. Why do they all refuse to acknowledge Chronic Lyme? What is their motive in completely ignoring the hard evidence in favor of Chronic Lyme and spreading misinformation? Why are innocent doctors getting their licenses revoked for treating Chronic Lyme Patients, especially when their patients are improving? Why is the Igenex test (a CLIA approved test!) not approved for use? Why do physicians get their licenses taken away for sending bloodwork to Igenex? Why does insurance not cover treatment for Chronic Lyme? Why are doctors not trained properly in diagnosing and treating Lyme? I will answer some of these questions at the end of this blog, so keep reading! Ok, so now that we’ve established that I have Lyme Disease, it is easy to get rid of it, correct? That’s what almost every credible medical website says, so that must be true,……right? This is so FALSE! This misinformation stems back to the recommendation of 1 medical journal, The New England Journal of Medicine, which in turn sets the stage for the IDSA, then the CDC, the state medical board, and then of course, this all of this trickles down to the doctors. These organizations claim that all cases of Lyme, even if they are diagnosed 7 years down the road, can be resolved with just a few weeks of antibiotics. Is that a joke??? I digress. This is simply untrue with ever piling evidence proving otherwise. The vast majority of Lyme Disease sufferers are not “cured” after a few, yet alone ONE round of antibiotics and remain sick as living proof with Chronic Lyme to this day. Not to mention these so-called antibiotics do not treat for the thousands of coinfections that come along with Lyme that can be just as bad, if not worse than the actual Lyme itself. So if it all starts with the New England Journal of Medicine, why on earth would they say that Lyme is not Chronic or a persistent infection? That is a wonderful question. 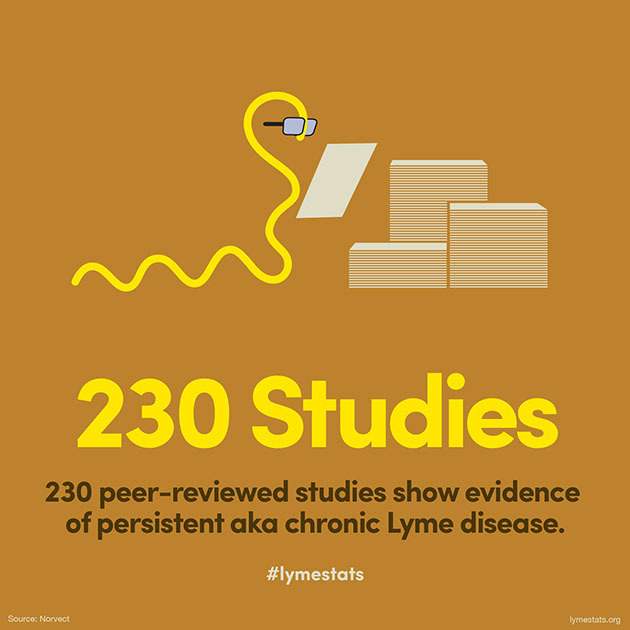 Seeing as how there are 300 peer-reviewed studies that say otherwise, I would love to know the real reason that NEJM doesn’t acknowledge Chronic Lyme! 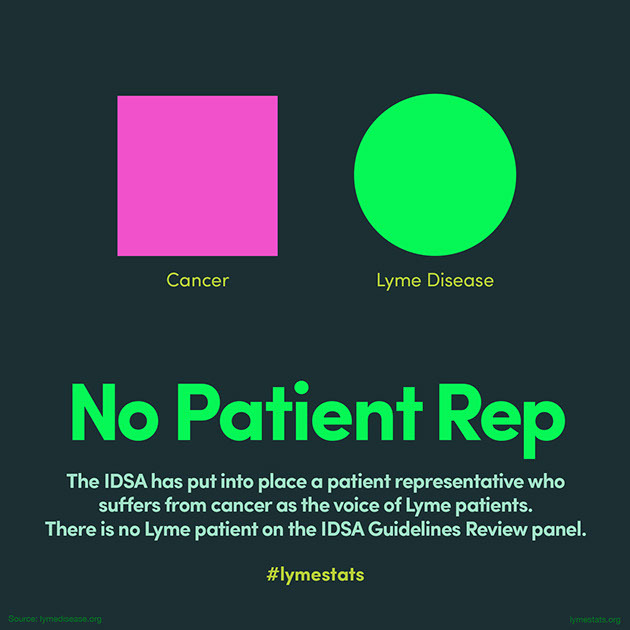 The NEJM based all of their conclusions about Lyme on studies that the IDSA conducted on get this… Early Stage Lyme patients. Um, excuse me? Early Stage Lyme patients? Last time I checked, the early stage patients were not the same thing as Late Stage patients! Why on earth would you write ‘Lyme Disease Guidelines’ for Late Stage Lyme Disease that are based on people who literally just contracted the disease (ie Early Stage Lyme)? That makes ZERO sense. It is well-known that if you catch Lyme early, that you have a good chance in beating it. If are late in catching it anywhere from 4 months after the bite to 7 or 8 years after the bite, then you have a serious illness on your hands. Get ready. 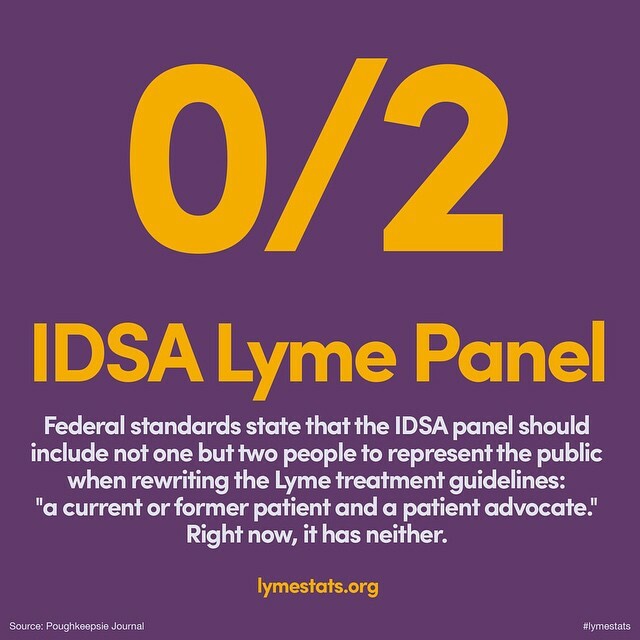 In addition, when the IDSA made the Lyme Guidelines, they COMPLETELY IGNORED 300 peer-reviewed studies scientists outside of their organization that proved just the opposite. They don’t even have a single person with Lyme or that treats Lyme on their board!!! A little messed up, right? Every single doctor is trained based on those IDSA guidelines, and unfortunately, they are beyond wrong. Well aren’t we out of luck! The current IDSA guidelines say that Lyme Disease will be cured within a few weeks of taking antibiotics. They also say that symptoms (similar to mine) occurring after the first round of antibiotics is very rare and “psychosomatic”. Both of these statements are FALSE! If you are one of the lucky few who just so happens to receive antibiotics almost immediately after the tick bite (Early Stage), then you have a good chance of being cured. However, for someone like myself who isn’t diagnosed until 7 years after the fact (AKA Late Stage), antibiotics will not cure the persistent infection in just a few weeks! 7 years down the road, these pathogens (I made that plural bc there is more than one!) have already moved into my brain as well as the hard to reach places in the body (i.e. deep tissues). As I am sure you are aware, the brain cannot be treated with antibiotics (making Lyme Disease very much so a neurological disorder affecting all parts of the body!). In addition, the Lyme invaders have been proven to build a protective biofilm around themselves that allows them to go virtually undetected from your immune system as well as the antibiotics. So essentially, it is just plain silly to think that a few weeks of antibiotics could cure something that takes the form of a biofilm and enters the brain. Once again, this is common sense! So…can’t you just solve the problem by taking more than the recommended 4 weeks of antibiotics? Can’t you just continue the antibiotics? You could, but good luck finding a doctor who will do that for you! They might lose their license for stepping outside of the IDSA guidelines! Even if you wanted to tackle this disease with antibiotics, insurance won’t cover it! Since this isn’t considered a ‘Chronic’ infection, insurance companies don’t have to pay for your continuous antibiotics. How convenient! In addition, not everyone with Late Stage Lyme/Chronic Lyme can be cured with continuous antibiotics. Some may be cured in a couple of years, 10 years, and for some antibiotics simply don’t work. Furthermore, the Chronic Lyme folks who are cured from antibiotics require many many types of very specific antibiotics with a very specific and complicated rotation. You have to find a doctor who sleeps and breaths reading the latest studies about Lyme in order to have an effective treatment with antibiotics. It’s still a gamble though bc for some people the antibiotics can make them worse. So you are probably even more confused now! I don’t blame you. So how does this all tie in? Why all of the controversy and misinformation from what seem to be like legit organizations all across the United States? 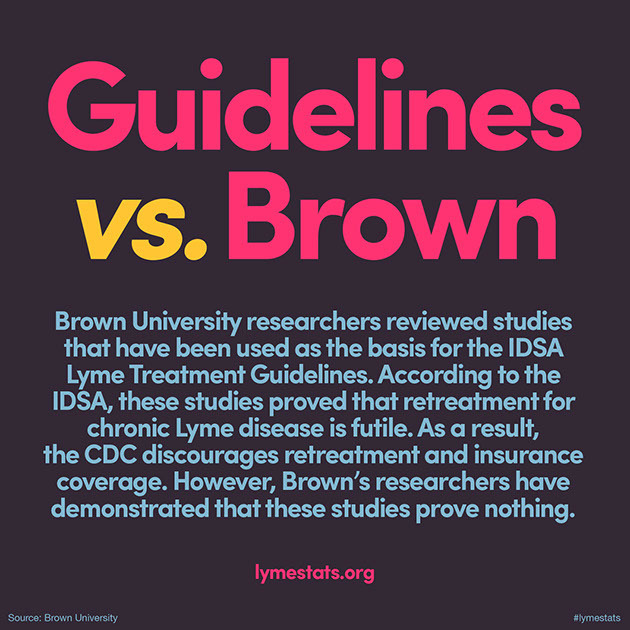 Why do the New England Journal of Medicine, IDSA, ALDF, Insurance Companies, and CDC do not acknowledge Chronic Lyme Disease? In addition, the link below somewhat explains what is going on from a high level. Ok, so back to what I am going to do next. Now that I know that I can’t trust the organizations that are supposedly supposed to protect me, and that I must continue to be my own advocate (ie basically my own doctor)…. Oh boy. So how on earth do you treat for Chronic Lyme/Late Stage Lyme? Is it even curable? 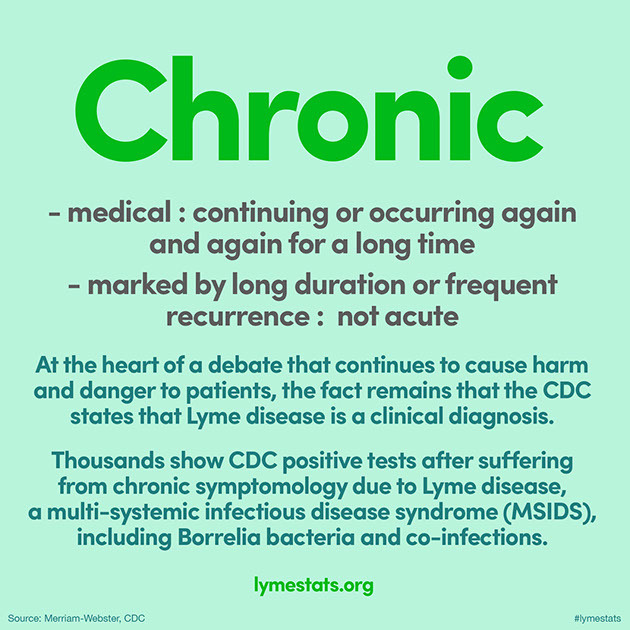 Let’s clear something up from the get-go…You can get Chronic Lyme under control (if you are lucky), but it never truly goes away. The moment your body is weak (due to vaccines, injuries, a family member dying, giving birth, a divorce, etc.) Lyme will pop out of the deepest parts of your body and surprise you again. Lyme symptoms can come back at any time if you deviate from your diet and treatment plan, etc so most of us like to call it ‘remission.’ Going into remission is definitely possible! However, not everyone does. The time in which it takes to go into remission is different for everyone. For example, it could take anywhere from a year of treatment to 10 years. You just never know. In addition, some people never go into remission. Some people die. Of the people that go into remission, I would say that about half of them do so with antibiotics and supplements, and the other half do so with just supplements. There are those that incorporate alternative therapies into their treatment plan as well. For example, Ozone Therapy, Hyperthermia Treatments, Coffee Enemas, Rife Treatments, iRMS mats, Zappers, etc. All it takes is a few controversial ingredients in a vaccine to completely disable your immune system to where every single pathogen, virus, fungus, and parasite you have ever some across completely take over your body. They are silently waiting for the perfect time to take over more territory. I could go into detail about some of those ingredients, but honestly, that is an entirely different topic that would take a lot of energy to explain. Maybe later?! Yikes! So what am going to do? I am going to stay positive and get through this. Do I think will get better? Yes! I am going to do anything and everything in my power to get back to the old me. Do I think that this is going to be easy? NO! I realize that I have a long and tough road ahead of me, but I am ready for it. So… is this going to be a huge lifestyle change? Yes, but that’s okay. So what if I can’t live exactly how I used to! I am going to view this as temporary lifestyle change until I kill off these pathogens. I am also going to view this as a test of strength and a time to rediscover myself. The hard part will be cutting out those cheat days! I mean… no gluten, no sugar, no dairy, no soy, no corn, no grains or nightshades, no GMO, no processed anything… yikes. In addition, me having a glass of wine once or twice a month, is out of the question until I go into remission. So unless I am going somewhere 100% organic, I will be awkwardly watching you eat your food and drink your alcohol, wink wink. Treatments thus far…I am already seeing some improvement from diet changes, supplements, and alternative types of therapies, so I am very hopeful. There is literally so much to learn and so many different things that I need to educate myself on that I wouldn’t even know where to begin to start telling you about it all. If you are curious as to some of the alternative therapies that I am doing or about to try, I’ll give you a quick snapshot. I am currently treating myself at home with a multitude of homeopathics and supplements. Aside from supplements, I consider Bee Venom therapy to be my main form of Lyme treatment. Yes, you heard me right Bee Venom. Bee Venom has helped me the most out of everything that I have done. In addition, I am using Rife Machine to help kill pathogens, viruses, parasites, and fungi (The gb4000). There is literally a frequency for everything, and you would be amazed at just how well this things works. I recently had my mercury fillings removed which made a HUGE difference (I could write a whole blog just on that topic.. save that for later though). Coffee enemas have made a huge difference as well due to our body’s inability to expel die-offs and years and years worth of chemical build up. Another 2 things that you probably didn’t realize were a huge part of Lyme Treatment are parasites and mold. I am doing extensive treatments for both which I could write an entire blog on (I’ll get to it when I can!). I know you are probably wondering what is my favorite lyme treatment out of everything above. The answer is Bee venom. Bee Venom has tremendously helped me with every single symptom. The physical symptoms are one thing… I can live with those. But the fact that bee venom helps with the brain too, it has allowed me to feel like myself here and there. As some of you who are reading this already know, most people with late stage lyme go through periods of depersonalization, depression, anxiety, and worst of all, their autism genes start to express to where you literally have a form of autism as you are trying to deal with all of this. The other sections of this blog are somewhat outdated (especially the treatment section) bc I have learned so much since I originally wrote this, but feel free to take a gander at them. I’ll try to get to it soon. My apologies, I am always writing this in such a hurry due to my schedule, but I will try to update it soon. This entry was posted in als, american doctors, amy tan, amy tan lyme disease, arthritis, avril levine, avril levine lyme, Best Test For Lyme, Best Test For Lyme Disease, Best Treatments For Lyme, Biggest Epidemic In America, biowarfare, brain dysbiosis, cdc, celebrities with lyme, celebrities with lyme disease, CENTERS FOR DISEASE CONTROL, cf, cfs, christie brinkley, christie brinkley lyme disease, chronic fatigue, chronic lyme, chronic lyme disease, coffee enema, CYSTS, daryl hall, daryl hall lyme, debbie gibson, debbie gibson lyme, DOCTORS, ears buzzing, ears ringing, epidemic, epigenetics, Epigentics, fibromyalgia, gene mutations, gluten intolerance, gulf war syndrome, gulf war syndrome and lyme, heavy metals, How Do You Get Lyme Disease, How To Diagnose lyme, How To Test For Lyme, How To Treat Chronic Lyme, How To Treat Lyme, How To Treat Lyme Disease, hulda clark, hulda clark zappers, ibs, ic, IDSA, immune disorders, infectious disease doctors, INFECTIOUS DISEASE SOCIETY OF AMERICA, inflammation, Is Lyme Disease In Texas, Is Lyme In Texas, Jamie Lynn Sigler, joint pain, late stage lyme, late stage lyme disease, leaky gut, Lyme, Lyme And Mold, Lyme debate, lyme disease, lyme disease and als, lyme disease and mcs, lyme disease and ms, lyme disease and multiple chemical sensitivities, Lyme Epidemic, LYME IN TEXAS, Lyme In The South, Lyme patents, Lyme Success Stories, lyme testing, LYME TREATMENT, LYME TREATMENTS, mcs, medical school, mercury, mercury fillings, mold illness, ms, multiple chemical sensitivity, muscle pain, muscle twitching, mystery illness, neurological disorders, no blood brain barrier, operation paperclip, parasites, pelvic inflammation, plum island, primary immune disorder, RA, removing roundworms, removing tapeworms, rope worm, ropeworm, ropeworms, roundworm, roundworms, stiff neck, tape worm, tapeworm, tapeworm in brain, tapeworms, Testing For Lyme, things doctors miss, tick, tick bite, ticks, Ticks And Lyme, Ticks And Lyme Disease, toxic encephalopathy, USA, what doctors are not taught in medical school, what doctors should know, What Is Lyme, What Is Lyme Disease, What Is Lyme Disease?, worms, YOLANDA FOSTER LYME, yolanda foster lyme disease and tagged abnormal scarring, abrupt mood swings, air hunger, alcohol intolerance, alopecia, als, American Doctors, Amy tan, Amy tan lyme, amy tan lyme disease, Arthritis, avril levine, avril levine lyme, bad PMS, Best Test For lYME, Best Test For Lyme Disease, Best Treatments For Lyme, biowarfare, blotchy or molted skin, brain dysbiosis, BRAIN FOG, brainfog, bruise easily, cardiac abnormalities, carpal tunnel symdrome, cdc, CDC Corruption, celebrities with lyme, celebrities with lyme disease, CENTERS FOR DISEASE CONTROL, christie brinkley, christie brinkley lyme disease, chronic fatigue, Chronic Lyme, Chronic Lyme Disease, coffee enema, CYSTS, daryl hall, daryl hall lyme, debbie gibson, debbie gisbon lyme, decreased libido, depression, discharge from breast, Doctors, dry chronic cough, dry mouth, dyspnea, eczema, endometriosis, epidemic, excessive thirst, fainting, fatigue, fibromyalgia, food intolerances, food sensitivity, forgetting words that you know, frequent urination, frozen shoulder, galactorrhea, Gene Mutations, gluten intolerance, Gulf war syndrome, gulf war syndrome lyme, haril loss, Health, hearing fluctuations, heart attack, heart palitations, heavy metals, How Do You Get Lyme Disease?, How Many People Have Lyme, How To Treat Lyme Disease, hulda clark, hulda clark zappers, ibs, IC, idsa, ILIADS, impotence, infectious disease doctors, INFECTIOUS DISEASE SOCIETY OF AMERICA, inflammation, insomnia, interstitial cystitis, isda, jamie lynn sigler, joint aches, joint pain, joint swelling, Late Stage Lyme Disease, late stage lyme disease treatment, light sensitivity, loss of tone, Lyme, Lyme And Gene Mutations, Lyme And Mold, lyme cardia, Lyme Controversy, Lyme Disease, lyme disease and als, lyme disease and mcs, lyme disease and ms, lyme disease and multiple chemical sensitivities, Lyme Disease Debate, Lyme Disease In Texas, Lyme Disease In The South, lyme disease treatment, Lyme Epidemic, LYME IN TEXAS, lyme patents, Lyme Success Stories, lyme testing, Lyme Texas, LYME TREATMENT, LYME TREATMENTS, lymph nodes swollen, mercury, mercury fillings, migraine headaches, migraines, miscarriage, mold illness, mood swings, morning stiffness, most misdiagnosed illness, MS, multi-symptom illness, Multiple Chemical Sensitivities, MULTIPLE SCLEROSIS, muscle twitching, Mycotoxins, mystery illness, neurological disorders, NeuroLyme, new england journal of medicine, night sweats, NIH, no blood brain barrier, noise intolerance, operation paperclip, paper skin, paralysis, parasites, pathogens, peridontal disease, photosensivity, plum island, pots, primary immune disorder, pulse skips, pyirform muscle syndrome, RA, Recovering From Lyme, removing ropeworms, removing tapeworms, ringing noises, rope worm, ropeworm, ropeworms, roundworm, seizures, sensory alterations, severe headaches, severe muscle weakness, shooting stabbing pains, smell intolerance, stiff neck, stroke, swollen testicles, sycope, tape worm, tapeworm, tapeworm in brain, tapeworms, temperomandibular joint syndrome, tender joints, Tertiary Lyme, the problem with medical school, things doctors miss, Tick, Tick bITE, Ticks And Lyme, Ticks and Lyme Disease, tinnitus, tml, toxic enephalopathy, treatment for chronic lyme, treatment for chronic lyme disease, treatment options for late stage lyme, trembling, tremors, unexplained toothaches, USA, using computer causes pain in hand and shoulder, what doctors are not taught in medical school, What Is Lyme, What Is Lyme Disease, worms, writing causes pain in hand and shoulder, xerostoma, YOLANDA FOSTER, YOLANDA FOSTER LYME, yolanda foster lyme disease. Bookmark the permalink. I was feeling soooo tired today and looked up some symptoms tonight and Lyme came up. I know I have seen info on this before and thought to myself “maybe”? But never really pursued it. I want to ask my doctor to test, but they too use Quest. And even if she does say ok lets do it. I am worried that it will come out negative and then be overlooked I am not sure how I should go about this. Any advise is appreciated. I live in the Long Beach, CA area. I googled doctors that specialize in Lyme and Dr Chitra Bhakta came up. She does use the Igenex test. I looked into her further and she was also on the Dr Phil show Deadly Consequences – that focused on lyme disease. She was actually treating one of his staff members. I did read up on her treatment and it looks like she does long term anti biotics – but don’t quote me on that. I hate antibiotics and do everything possible to stay away from them. I am going to call her this week though to get that test done for sure. Just to see if that is even what I have. But after all the research I have read tonight, its seems pretty close. We will see. Thank you for the quick response! I really appreciate it and I will let you know. You could also try rectal insufflation post sauna treatment depending whether you use medical grade oxygen as your source to generate medical ozone. let me know if you need assistance, help, advice. Use the email given to contact me. Hi Lisa, great blog!! I live in DFW and am new to all this, finally diagnosed this year. Saw Dr.s in CA started treatment, had a positive TB test (no active tb). Had to stop Lyme treatment and do treatment for latent tb. Looking for a Dr. In this area. Any suggestions? I found someone but not sure as he th8nks my Lyme is secondary to parasites. Would love to hear from you, also willing to volunteer! Lisa – thank you. I am so happy to read your blog as I have been looking for an mcs-als-lyme connection. You sum it all up very concisely – especially about mcs. Just starting my journey (diagnosed with mcs 2001, found a tick in me July 2015, als diagnosis October 2016, started long term antibiotic treatment for Lyme disease November 2017…also doing Paleo +). I will look into Bee Venom treatment soon as there is apiary an hour from me …I live in Northern Ontario Canada. Also had it in mind to get a zapper. Thank you for writing such an incredibly informative blog!! !